[New for 2012] Since I tend to be a bit of a space case this time of year due to weather changes, pollen overload, and everything else, I can get lost in the fog of everything going on. Humidity and congestion just go so well together.... Ofcourse, being foggy doesn't mean I'm not hungry. I know I wanted to pick something up on the way back from Home Depot, but I just wasn't sure what to get. 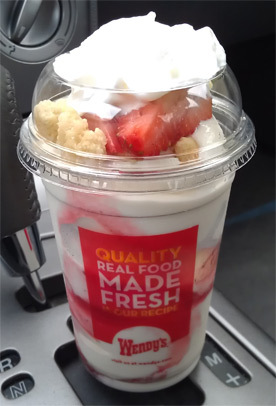 Thankfully Nick reminded me that the new Wendy's Strawberry Frosty Parfait is out. I don't know what it is, but once I heard strawberry and frosty, off I went. Well I had questioned if the 2011 Wildberry Parfait would be back. 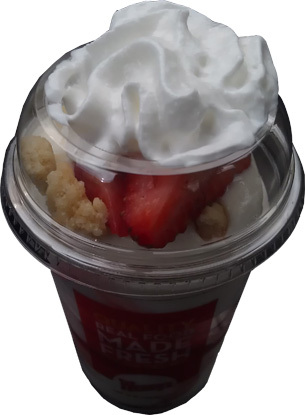 The answer appears to be a big NO now that the Strawberry Shortcake parfait is here. It's "creamy vanilla [frosty] with fresh hand-cut strawberry and shortbread cookies to make the perfect summer re-treat". Hey, looking closer, that looks like half the parfait toppings compared to what I see on grubgrade. That other one easily has twice the strawberry and shortcake bits, but more importantly, it looks to have at least twice the sauce that mine did. Oops, wait, I'm complaining before reviewing. Let's start over. I stare at my 10oz cup for a moment and decide how to proceed. If I pop the top, I risk a mess of whip cream. If I leave the top on, I'll slow myself down trying to eat through a narrow opening - - - I'm feeling messy, so the lid stays on. I take my first bite which has all the components on it... Tasty enough! Ofcourse, that leaves me with one other strawberry chunk. Doh! That's just cheezy, but to be honest, we all know it's the strawberry sauce that is going to make or break this treat. I decide it's time to dig down deep and grab some of it. Mmmm, even tastier. 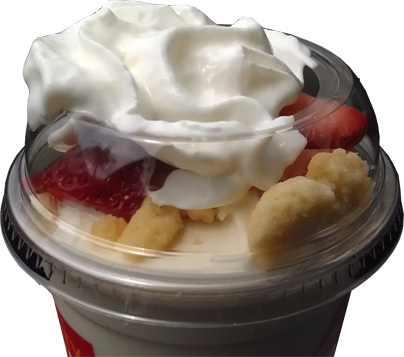 It's a nice traditional sweet strawberry sauce that goes very well with the fresh cold vanilla frosty. I'm getting rogue crunchy shortcake cookie bits along the way. On one hand I appreciate their crunchiness, on the other hand I will kind of miss them when they are gone. My crunch loving side wishes I could smash them up a bit to spread out the crunch evenly throughout the entire treat. The crunch bits are gone and so is the strawberry sauce. Uggg, it's a tasty treat but way too many bites are sans strawberry. You all know I love a good sweet berry flavor and I can't decide if this treat is making me happy or sad... nah, I'm still happy, but I could be real happy had there been more sauce. Do I recommend you try this? Yes, because you'll either get a nice treat like grubgrade did, or you'll get a decent treat like I did. A little tweak and some store to store consistency would guarantee I pick up several more of these over the summer, but as it stands, I'll probably get one or two more here and there depending on how hungry I am. I LOVEEED IT! Tastes like a good humor bar! It's absolutely fantastic! Not too sweet . The short cake was hard as rock. Not worth the time of sifting through those rocks.